Showcase the process based development of contemporary design. The cooperation of computer aided design = CAD and traditional craftsmanship. Metamorphose of formal aspects of industrial manufacturing and uniqueness which can only be achieved from traditional handmade crafts. Metamorphose of a cylinder and one straight as well as one upside-down smaller cone in CAD, conversation through CNC lathe and traditional craftsmanship. The shapes a computer generated, meanwhile its manufactured using crafts the improper ornament of the ridges become decoration. The design is subsidized by the colour graduation of solid coloured porcelain compound. The set consits of nine shapes and five colours. 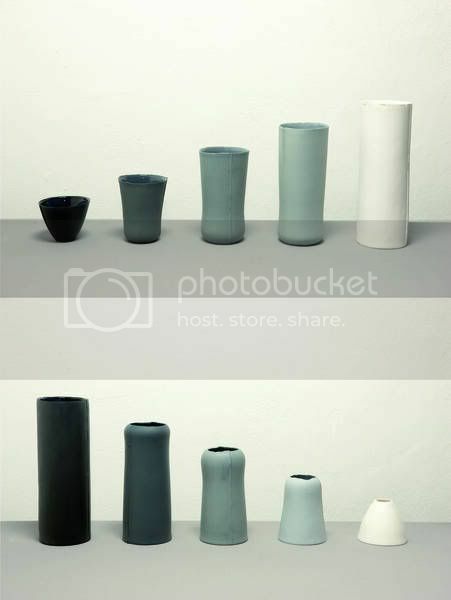 The vessels can be ordered individually and in seven different colours.